Beautiful Namibia sets itself aside from other African countries as its varied landscapes consist of five unique geographical areas. A vibrant country, Namibia hosts some of the most beautiful and vivid national parks in all of Africa. The Namib Desert consists of majestic red dunes with vast, stretching sandscapes of pinks and oranges, while the sprawling white sands of Etosha National Park display vast and open plains. You can find yourself overlooking impressive and dramatic views of Fish River Canyon, the largest canyon in Africa, or exploring the eerie, fogged shores of Namibia’s Skeleton Coast. Namibia is home to an abundance of wildlife including cheetahs, elephants, lions, as well as black and white rhinoceros, as the country has implemented conservation measures in order to protect the rare and endangered species that populate its national parks. 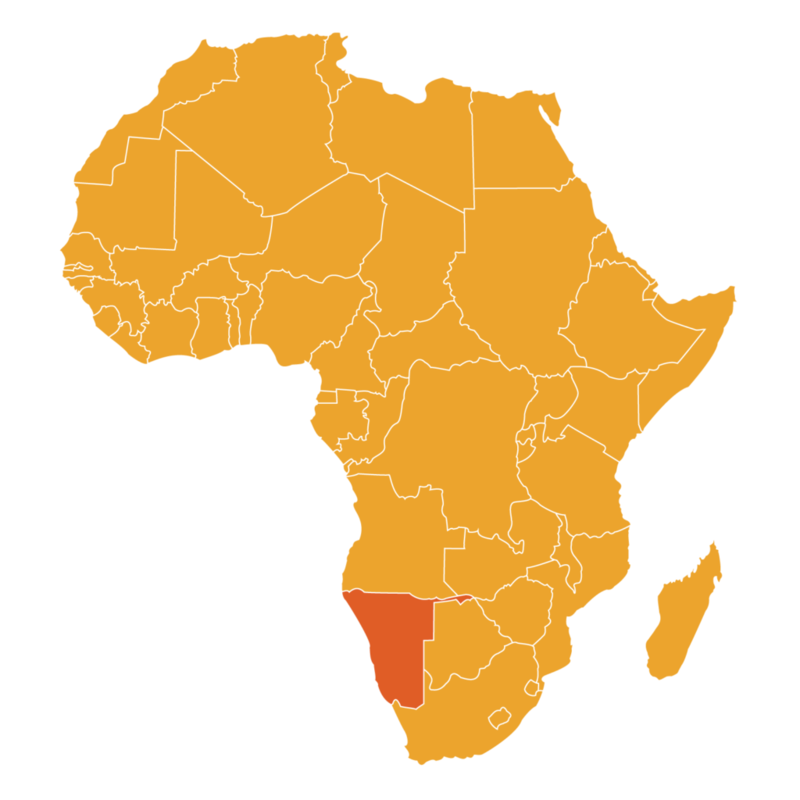 Namibia is a country in Southern Africa bordering Zambia and Angola to the North, Botswana to the East, and South Africa to the South and East. Rich in diverse culture, up to 30 languages are spoken within the country and it is home to 2.2 million people, consisting of thirteen different ethnic groups. The country has experienced its share of complications, as it was previously colonized by German settlers in 1884, and thus became known for some time as “German South West Africa”. Namibia in later years continued to struggle for its independence after coming under rule of South Africa until 1990, finally gaining independence after 106 years of German and South African rule. The capital of Namibia is Windhoek, a city with a population of 325,858 occupants. Although the country has seen its hardships, it continues to grow economically at a steady pace. Namibia hosts scenic towns and beach cities known for their charm and colonial architecture, such as Lüderitz, a harbour town located in Southern Namibia and Swakopmund, a beach resort on the coast of Western Namibia. From its uniquely colourful natural wonders and varied wildlife, to its equally as diverse blend of culture and customs, Namibia offers a myriad of inspiring attractions. The Namib-Naukluft National Park is arguably Namibia’s most famed destination, and Africa’s largest game park. It is one of the main reasons people travel to Namibia from all over the world. The park is made up of a large portion of the Namib Desert, and is home to many species of wildlife (most prominently seen are oryx and Springbok), although the area is more so visited for its scenic desert landscapes. The most well-known area of the park is Sossusvlei, which consists of mounds of vibrant red dunes, stark and stretching salt pans and contrasting, expansive blue skies. ”Dune 7″ in the Namib Desert is known to be the tallest recorded sand dune in the world, though the tallest within Sossusvlei itself is a massive, reaching dune that has been dubbed “Big Daddy”. The sand itself that comprises the immediately noted, vibrant red dunes found in the region is known to be roughly five million years old. The ancient vegetation found in the region attracts viewers, as the camel thorn tree fossils that exist in the area are said to be roughly 900 years old. Etosha National Park is a rare spectacle in terms of wildlife viewing, it’s abundance of mammals makes searching for game unnecessary as animals are known for approaching sites directly in front of park visitors. The park is composed of both salt pans and vegetation, the pans making up only 23% of the park. Teeming with various species of wildlife, some of the animals that Etosha inhabits include zebras, giraffe, cheetah, hyenas, black rhino, white rhino, elephant, mongooses, warthogs, meerkats and more. The many watering holes are some of the best places for visitors to experience game viewing during their travel to Namibia, as animals (particularly in dry months) emerge to scour the land for water to drink from. Fish River Canyon with its magnificent cliffs carved from the erosion caused by both wind and water is the largest canyon in Africa and the second largest canyon in the world, measuring 160km in length, stretching up to 27km in width and extending in depth for 550m. It is a major attraction in Namibia, as the 500 million-year-old canyon consists of hiking trails that boast incredible views of the valley. Many species of wildlife are found in Fish River Canyon Park, including over 200 species of various birds, many aquatic animals found in the Fish River itself, as well as reptiles including snake and lizard species. Mahango Game Reserve is an area of the Bwabwata game park, it was established in 1986 as a protected park and lies close to the Western side of the Okavango Delta. This game reserve has an interesting history, as it had previously been designated a military space, not having been declared a conservation area until Namibia gained its independence in 1990. The game reserve is home to various wildlife that can be spotted by visitors, including mass herds of animals that roam to find water in the dry season. Lions, Cheetahs, elephants, leopards and hippopotamus can be spotted at this site, the park during these dry months is a great game viewing opportunity for visitors. Vegetation that grows over the area consists of reeds, papyrus, shrub and grasslands. There are many baobab trees within the park, along with other natural wonders and wildlife that call the park their home. Birding is very popular in Mahango, as many ?owers and fruits sprout from the trees and draw birds near, as many as up to 400 species have been noted to live within the reserve.